There are several areas where d7 may use email features. You might want to send yourself an email of d7’s info report, for example. In this case, d7 needs an SMTP account in order to send email. 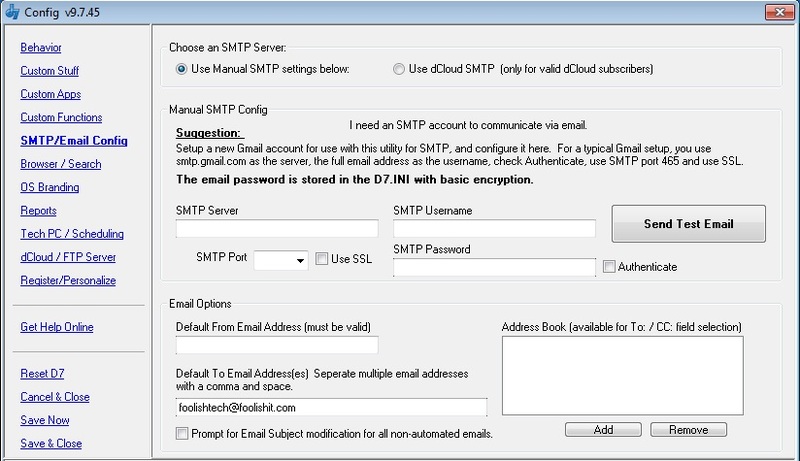 Choose an SMTP Server – Users of dCloud may opt to use the dCloud SMTP for sending email, but without a dCloud account you must manually configure your own email server below. Manual SMTP Config – This area should be self-explanatory. Note that the only security technology supported is SSL. The Send Test Email button will only work if the Default From: and To: Email Address fields on the bottom left are filled out – otherwise where does d7 know to send an email to nor specifiy who it is from! Default From Email Address – must be filled out. This is the email address d7 emails will appear they are FROM. This is very useful when submitting d7 feedback or bug reports via the UI so I can easily click to reply to your appropriate email address; so it is helpful for this to be your main email address. Prompt for subject modification on all non-automated emails – does exactly what it says, giving you the opportunity to change the subject line for certain emails d7 can send. Address Book – You may add email addresses here to be listed in the To: / CC: email selection boxes on certain d7 email forms. Useful if you have multiple techs or other reasons to send email to different pre-defined addresses. At times when d7 prompts you for email addresses to send to, it can pre-populate the list in the To: and CC: fields with email addresses found configured on the particular system you are working on. Useful to direct a particular email to the very customer’s PC that you are working with. At the time of this writing, this is accomplished by parsing the output of Nirsoft’s MailPV for the list of addresses, however this may be subject to change in methodology at any time because currently, that particular app may be flagged by any active anti-virus software on the system and prevented from execution.